Is there anything cuter than a garden gnome?! Seeing one stand proudly around the plants and flowers is enough to put a smile on anyone’s face. Dressing up your little tyke in this Toddler Garden Gnome Costume can grow smiles wherever you go! Gnomes always seem to be hard at work when you see them in a garden. They’re always busy tilling a plot of land, or watering some flowers, or just kicking back after a long day and enjoying the sun. If you’ve ever seen a gnome outside of a garden, though, you know that they’re usually up to the same antics; tilling and watering whatever they are standing next to, or just laying around, looking for something to do. That’s just the way garden gnomes are, and if you ask us, it looks like a great way to spend the day! Even if you don’t have a garden, your little kiddo will look pretty precious dressed up as a pint size gnome, and they can still go about playing in the yard, or just laying about. It’s an outfit that’s practically made for an adorable photo op, so be sure to have your phone ready to snap those gnome pics to show everyone! 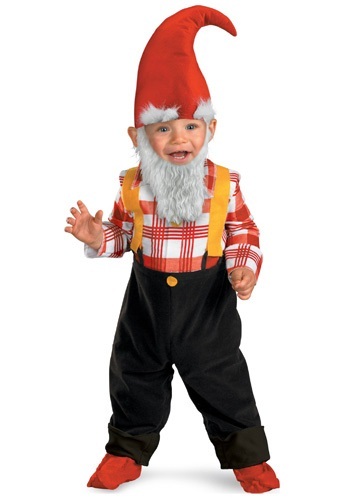 This costume comes with everything you’ll need to give your little one the complete gnome makeover. The one-piece jumpsuit is designed to look like the traditional rugged overalls and shirt worn by garden gnomes, and the soft, pointy cap has bushy, gray eyebrows already attached. Then, just put on the bushy accessory beard and the booties, and they’ll be ready for trick-or-treating, or just spending a lazy day in the garden!